51 October/November 2018 unmanned systems inside T he idea behind Agriculture and Space Day was to make sure everyone appre- ciated just how much space technolo- gies contributed to the agriculture sector. The setting was a field of grass in the back garden of the historic natural science mu- seum, a surprisingly quiet space in the heart of Brussels, dominated by the looming glass and steel European Parliament building. 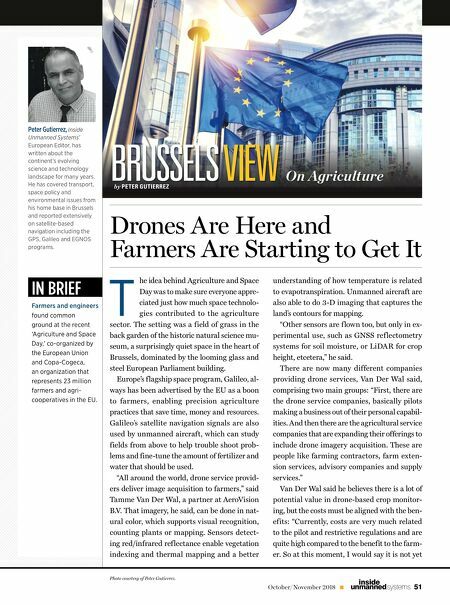 Europe's f lagship space program, Galileo, al- ways has been advertised by the EU as a boon to farmers, enabling precision agriculture practices that save time, money and resources. Galileo's satellite navigation signals are also used by unmanned aircraft, which can study fields from above to help trouble shoot prob- lems and fine-tune the amount of fertilizer and water that should be used. "All around the world, drone service provid- ers deliver image acquisition to farmers," said Tamme Van Der Wal, a partner at AeroVision B.V. That imagery, he said, can be done in nat- ural color, which supports visual recognition, counting plants or mapping. Sensors detect- ing red/infrared ref lectance enable vegetation indexing and thermal mapping and a better Drones Are Here and Farmers Are Starting to Get It Peter Gutierrez, Inside Unmanned Systems' European Editor, has written about the continent's evolving science and technology landscape for many years. He has covered transport, space policy and environmental issues from his home base in Brussels and reported extensively on satellite-based navigation including the GPS, Galileo and EGNOS programs. IN BRIEF Farmers and engineers found common ground at the recent 'Agriculture and Space Day,' co-organized by the European Union and Copa-Cogeca, an organization that represents 23 million farmers and agri- cooperatives in the EU. understanding of how temperature is related to evapotranspiration. Unmanned aircraft are also able to do 3-D imaging that captures the land's contours for mapping. "Other sensors are f lown too, but only in ex- perimental use, such as GNSS ref lectometry systems for soil moisture, or LiDAR for crop height, etcetera," he said. 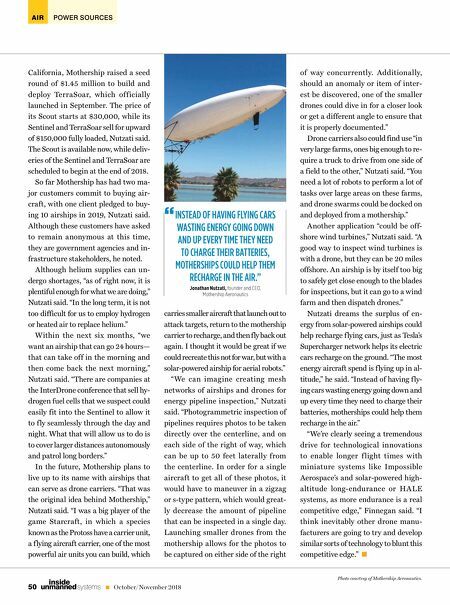 There are now many different companies providing drone services, Van Der Wal said, comprising two main groups: "First, there are the drone service companies, basically pilots making a business out of their personal capabil- ities. And then there are the agricultural service companies that are expanding their offerings to include drone imagery acquisition. These are people like farming contractors, farm exten- sion services, advisory companies and supply services." Van Der Wal said he believes there is a lot of potential value in drone-based crop monitor- ing, but the costs must be aligned with the ben- efits: "Currently, costs are very much related to the pilot and restrictive regulations and are quite high compared to the benefit to the farm- er. So at this moment, I would say it is not yet BRUSSELS VIEW On Agriculture by PETER GUTIERREZ Photo courtesy of Peter Gutierrez.